Looking out a second-story window of her family's quarters at the Pearl Harbor naval base on December 7, 1941, eleven-year-old Jackie Smith could see not only the Rising Sun insignias on the wings of attacking Japanese bombers, but the faces of the pilots inside. Most American children on the home front during the Second World War saw the enemy only in newsreels and the pages of Life Magazine, bu… t from Pearl Harbor on, "e;the war"e;--with its blackouts, air raids, and government rationing--became a dramatic presence in all of their lives. Thirty million Americans relocated, 3,700,000 homemakers entered the labor force, sparking a national debate over working mothers and latchkey children, and millions of enlisted fathers and older brothers suddenly disappeared overseas or to far-off army bases. 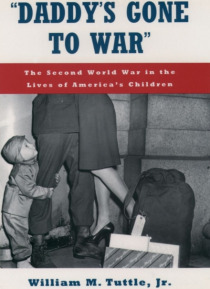 By the end of the war, 180,000 American children had lost their fathers. In "e;Daddy's Gone to War"e;, William M. Tuttle, Jr., offers a fascinating and often poignant exploration of wartime America, and one of generation's odyssey from childhood to middle age. The voices of the home front children are vividly present in excerpts from the 2,500 letters Tuttle solicited from men and women across the country who are now in their fifties and sixties. From scrap-collection drives and Saturday matinees to the atomic bomb and V-J Day, here is the Second World War through the eyes of America's children. Women relive the frustration of always having to play nurses in neighborhood war games, and men remember being both afraid and eager to grow up and go to war themselves. (Not all were willing to wait. Tuttle tells of one twelve year old boy who strode into an Arizona recruiting office and declared, "e;I don't need my mother's consent...I'm a midget. "e;) Former home front children recall as though it were yesterday the pain of saying good-bye, perhaps forever, to an enlisting father posted overseas and the sometimes equally unsettling experience of a long-absent father's return. A pioneering effort to reinvent the way we look at history and childhood, "e;Daddy's Gone to War"e; views the experiences of ordinary children through the lens of developmental psychology. Tuttle argues that the Second World War left an indelible imprint on the dreams and nightmares of an American generation, not only in childhood, but in adulthood as well. Drawing on his wide-ranging research, he makes the case that America's wartime belief in democracy and its rightful leadership of the Free World, as well as its assumptions about marriage and the family and the need to get ahead, remained largely unchallenged until the tumultuous years of the Kennedy assassination, Vietnam and Watergate. As the hopes and expectations of the home front children changed, so did their country's. In telling the story of a generation, Tuttle provides a vital missing piece of American cultural history. Otros eBooks de William M. Tuttle Jr.